Summer's officially here, and all across the country it's arrived with a vengeance, bringing temperatures that could top 100 °F. Which is crazy. In fact, crazy enough to justify this not-so-ceiling fan which rains down a cool breeze on you all day long. Apparently designed for use on patios (or homes without ceilings) Fanimation's free-standing Torrento is waterproof so you can leave it out all year round, even if it rains. For around $1,000 you get your choice of almost 50 different styles of blades, from wood, to woven bamboo, to even natural looking palm leaves. 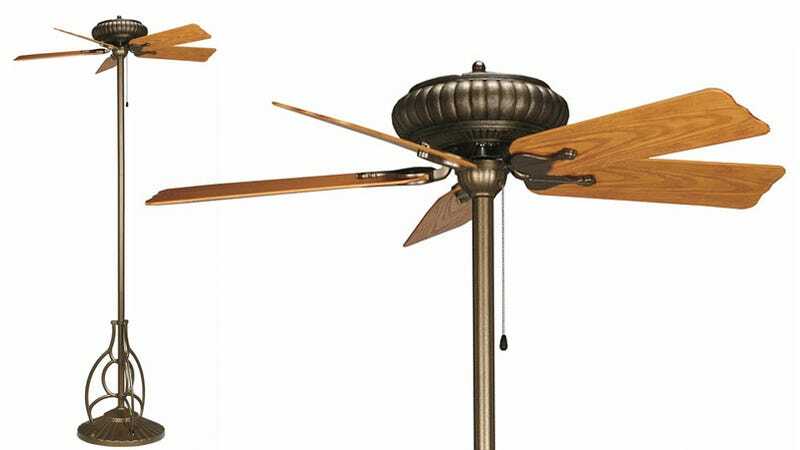 And while it's a little unorthodox as a way to stay cool, it's an easy way to add a ceiling fan to any room if you lack the requisite handyman skills to install the real thing.